This is an ongoing documentary series started in 2016 and currently consisting of over 50 photographs. On the surface these tip jars display the various creative (and not so creative) approaches service workers ply for more compensation. 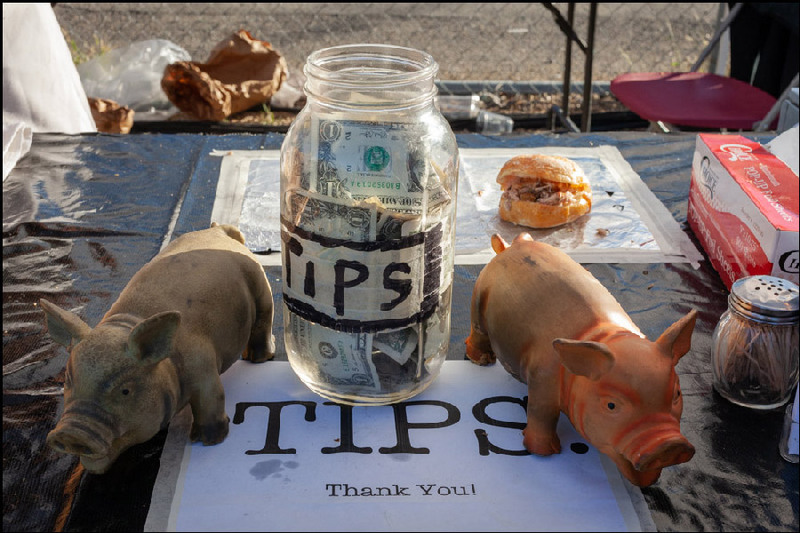 On a deeper level the request for tips demonstrates the insufficient hourly pay that typical service workers receive, as well their desire for approval and the relationship between buyer and seller (which can have a discrete tension). Furthermore, tip jars speak to the decades-long income plateau of the middle class, as once high-paid manufacturing jobs have moved abroad, fringe benefits have declined and job security has transformed into 'gigging.' The rising cost of living is heavily driven by the strength of the finance and tech sectors, while service economy workers try to find a footing.